PC Download Instructions without images is available in Word and PDF format. There are more than 19,000 National Library Service (NLS) audio books available for download and over 200 WTBBL audio books available for download. 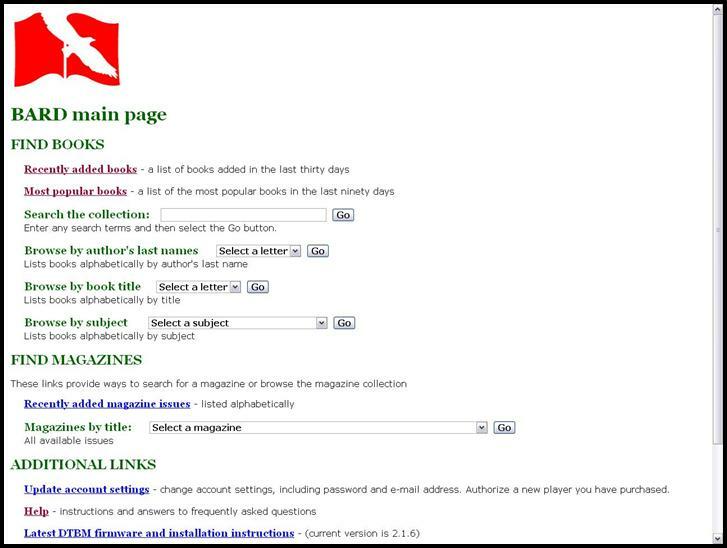 By downloading books, or having a friend or family member help you download, you have immediate access to the newest titles and current issues of magazines. You can also keep the books you download forever! Note: This service is only available to individuals eligible for Washington Talking Book & Braille Library (WTBBL) and National Library Service (NLS) programs. • a USB storage device (aka, thumb drive, flash drive, or travel drive). If you do not have an email address and need help signing up for one, please call the library to talk to a librarian for assistance. Fill out the online application form at NLS BARD (nlsbard.loc.gov). Your name and address must be entered exactly as they were given to WTBBL or your eligibility cannot be verified. Your login and a temporary password will be emailed to the email address you used in the application. When you log in, first create a new password. If you have problems with your password or application, please contact the WTBBL BARD administrator (206) 615-0416. If you would also like to download an ever-increasing number of WTBBL-produced audio books available through the WTBBL website, first sign up for BARD and then contact Library staff to activate your WTBBL account ID and password for downloads. Individuals in other states may also use this service, but will need a WTBBL account ID and password. Contact WTBBL staff at wtbbl@sos.wa.gov. We will verify your status at the LBPH library in your state and email you an account ID and password. The following describes the 2-part process to download on a computer using Windows XP. If you have different operating system, such as Vista or Windows 7, dialog boxes and their choices may be slightly different. Step 1: BARD downloads: Log in to https://nlsbard.loc.gov with your NLS username and password. Step 2: After login, you will be on the BARD or WTBBL main page (Figure 1). A good place to start is the recently added books and the most popular books pages. If you know what you are looking for, you can search using the "Search the collection" text field, which searches in the title, author, subject, annotation, book number and narrator fields. You can search for magazines by title or by recently added issues. Each section or search choice is marked with heading markers for screen readers. Step 3: Once you arrive at your chosen book, find the blue link associated with that book. The link will be below the summary. The link will be below the book's summary. Click the link or press Enter to begin the download (Figure 2). Step 4: A window will open asking if you want to OPEN or SAVE the book. Select SAVE and click OK.
a. Internet Explorer: A window will open in which you must specify where you want to save the downloaded book. Choose a desired location (not the desktop) on your computer where you want to save the book. Once you have made your selection, click SAVE. b. Firefox and Chrome: Your browser will automatically download the title into a “Downloads” folder in your “My Documents” folder. 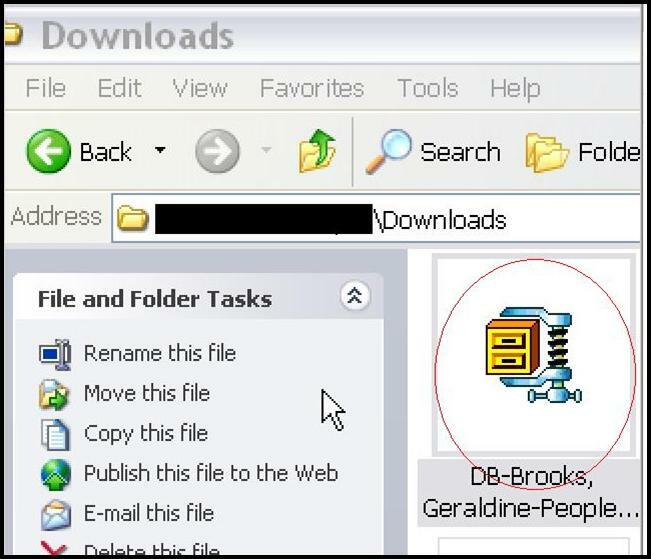 Step 6: A download window will then open showing the progress of thedownload. Depending on the length of the book and your internet provider, this could take between 30 seconds and 10 minutes or more. Step 7: While this book is downloading, you can go back to BARD and search for another title. Once the download is complete, you may close or minimize your internet browser. 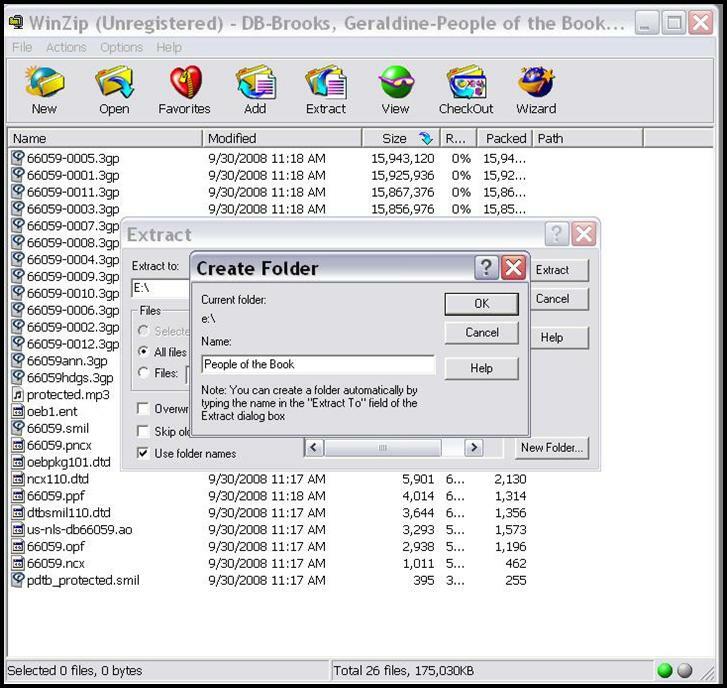 The downloaded book is contained within a single .ZIP (or compressed) file containing several necessary files for the book. You must first unzip (or extract) the book files before it will play in your player. Note: these instructions are for use with adigital talking book machine (DTBM); if you have a commercial device, you will want to consult your user manual for any slight variations. Step 1: Plug your flash drive into a USB port on the computer. There is more success if the flash drive is empty of anything but audio books. Any other files must be deleted or they will prevent the books from playing. 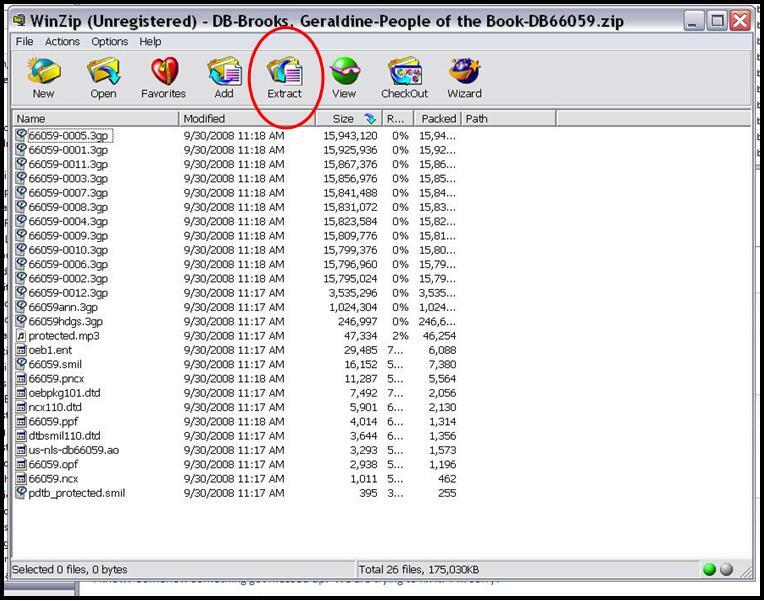 Step 2: Go to where you have saved the downloaded book and double-click the zipped file icon (Figure 3). Step 3: This should automatically open an “Unzip” program. 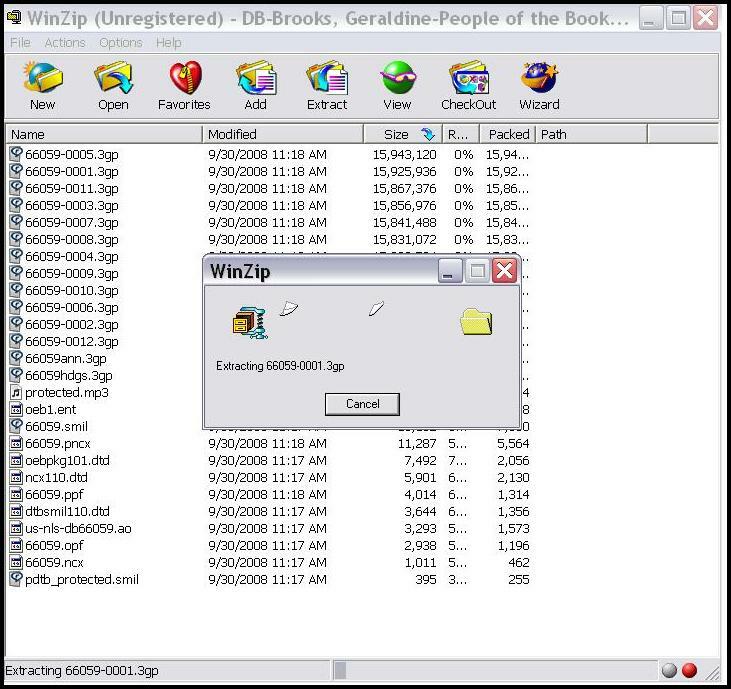 If an unzip wizard does not open, this means you do not have an unzipping program. Do a search for a free program to unzip compressed (zipped) files and download the program onto your computer. Step 5: Click on “extract or extract all” button. Step 6: The program will ask you where you want to “extract to”and you should select the flash drive (Figure 5). This will sometimes be calleda “Removable Disk” or “USB Mass Storage Device” in your My Computer folder. Step 7: After you’ve selected your flash drive. Select the “NewFolder” button (Figure 5). Name the folder the title of the book (Figure 6). If your unzip program does not have a “New Folder button” go to Step 8. Step 8: If your unzip program does not ask you to create a folder. 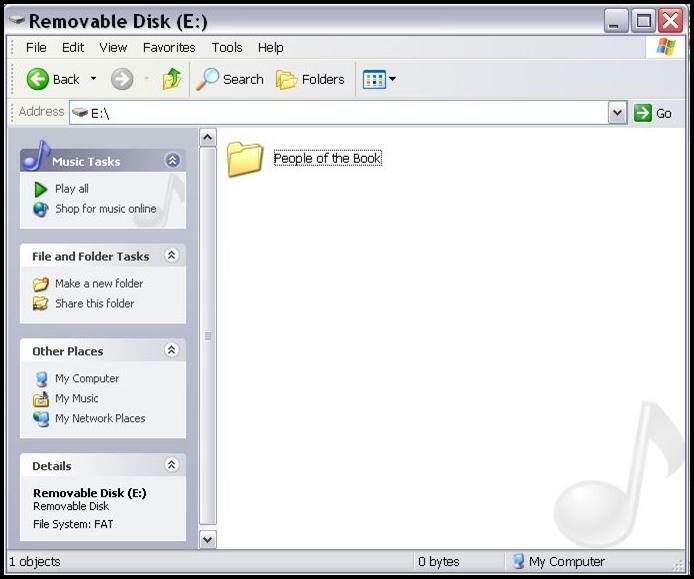 Create a folder in your flash drive before unzipping by finding your flashdrive/removable disk on your computer (in the My Computer folder) and creating a new folder from the File menu (Figure 7). Go back to your unzipping program (Step 6) and select your new folder in your flash drive. Step 9: After you have told your unzipping program where to extract (move) your book files, you hit the “Extract” button (or OK for some programs). The extracting process will start (Figure 8) and may take a few minutes for longer books. Step 10: Repeat the same steps for each downloaded book. Step 11: After you have completed downloading and extracting your books, close all open windows. Step 12: Remove the flash drive or cartridge following your computer’s recommended practice for removing USB media. Step 13: To play the books: insert your flash drive into the USB port on the right side of the DTBM. To browse through the books on your flash drive you will use the Bookshelf mode. To open the Bookshelf press and hold the Green (Square) Play/Stop button for 5 seconds to access the bookshelf. You will hear a beep and a voice announce “Bookshelf” and the number of books on the flash drive. Use the RW and FW keys to locate the book you want to read. To go from Book 5 back to Book 1, use the RW button. Push the Play/Stop key again to begin playing the book. If you have more questions, check out the NLS BARD FAQ page or call the library.